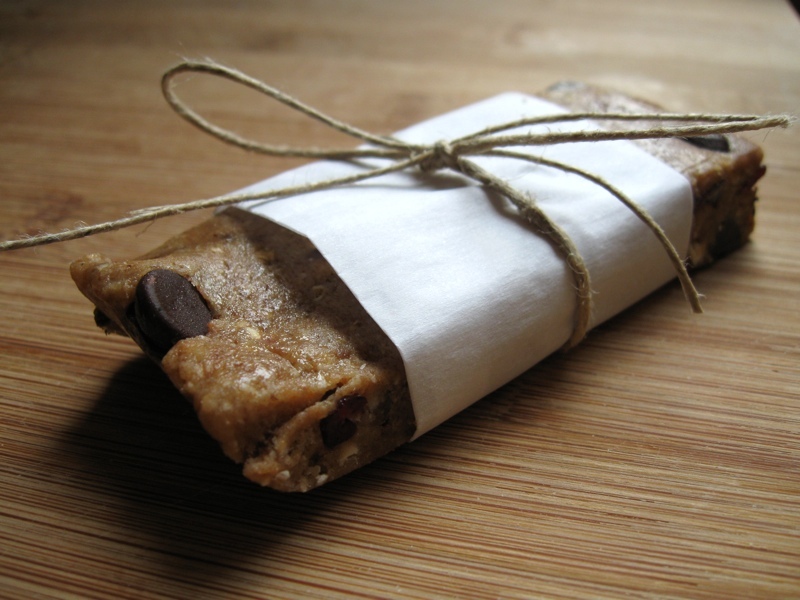 Granola bars are an awesome snack - they're portable, filling, and they kick that mid-day sweets craving right in the mouth! But store-bought granola bars often come with unnecessary added sugars and preservatives; things I really try to avoid. 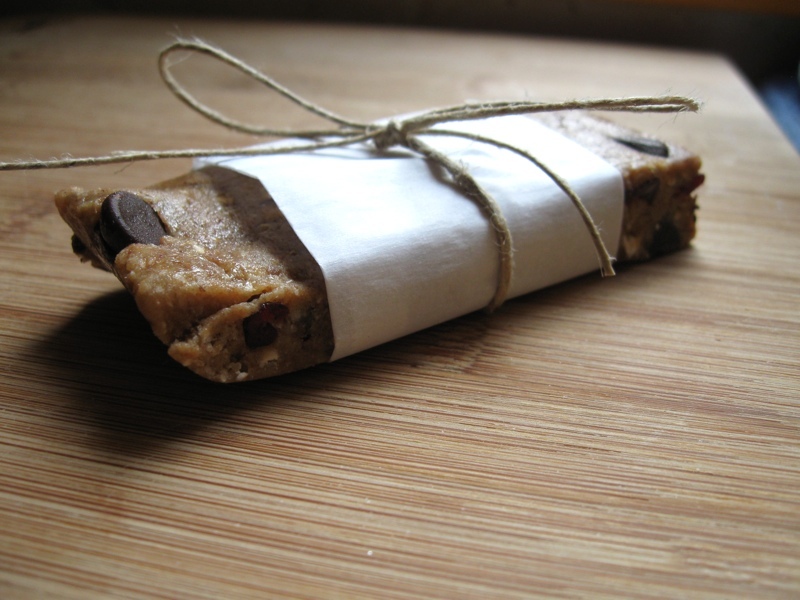 So when my sister made these oh-so-simple and actually-good-for-you granola bars, I just had to follow suit. She didn't use a recipe, so I made it up as I went along and made sure to write down the process so that I would be able to share it here. The only thing you need (aside from the ingredients) is a food processor. I used my mother's ancient Cuisinart; it still works like a pro even after all these years. If you enjoy things like granola bars, sauces, nut butters, and dressings, food processors are an investment well worth making. Put the dates in your food processor and pulse them until they are completely pulverized and form one big mass. Add the peanut butter and honey and pulse to incorporate. 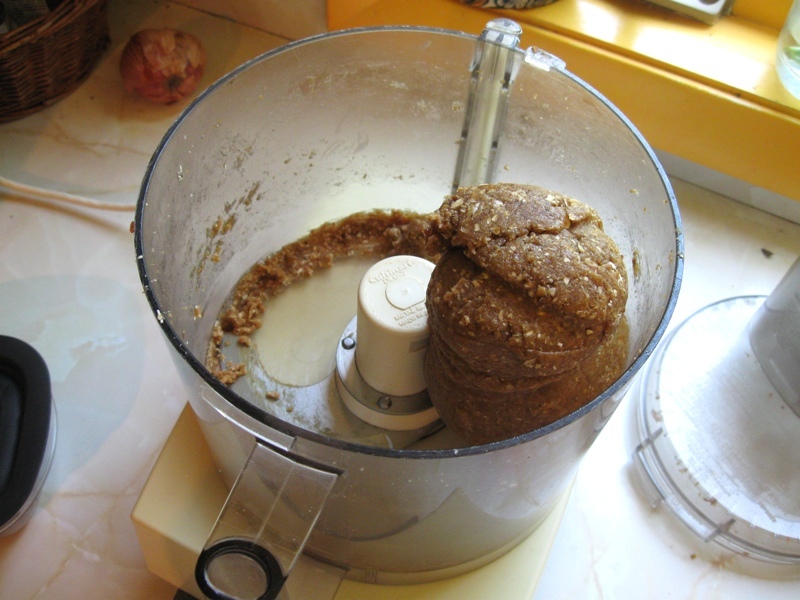 Add the coconut and oats and pulse until one big ball of granola 'dough' forms (see photo below). At this point I transferred the dough to another bowl and worked in the cranberries and chocolate chips using a spatula, but you could also pulse them in with the food processor if you prefer (I wanted to keep the chocolate chips intact). Line an 8x8 pan with parchment paper and press the dough into it until uniformly flattened. Cover with plastic wrap or parchment paper and refrigerate until firm, about 20-30 minutes. Once firm, cut into 8 bars and store in an air tight container in the refrigerator; enjoy at your leisure! The perfect granola bar consistency! The beautiful thing about these granola bars is that you can add whatever fruit and nuts you desire. I used cranberries and chocolate chips because that's what I had around, but things like almonds, hazelnuts, and dried cherries would work just as well! Or you could take a tropical spin on it and add dried pineapple, mango, and big coconut flakes. And if you don't like peanut butter, almond or sunflower butter will work just as well! I really love versatile recipes like this. 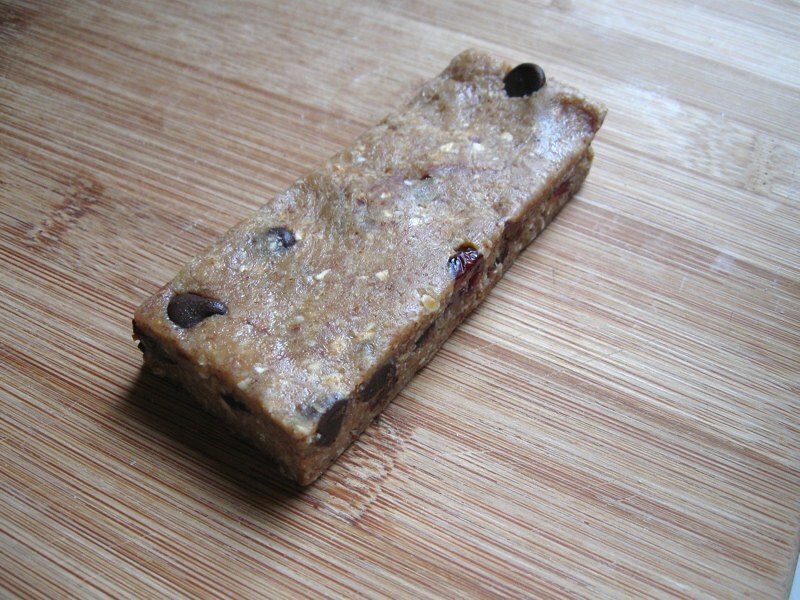 A naked but delicious granola bar. This recipe is so easy, you'll find yourself making it at least once a week if you happen to have the ingredients on hand. It's also perfect for summertime because it's no-bake! No one wants to turn the oven on when it's 80+ degrees outside... not even this baker! Let me know what flavor combinations you decide to try! The finished product, all dressed up.